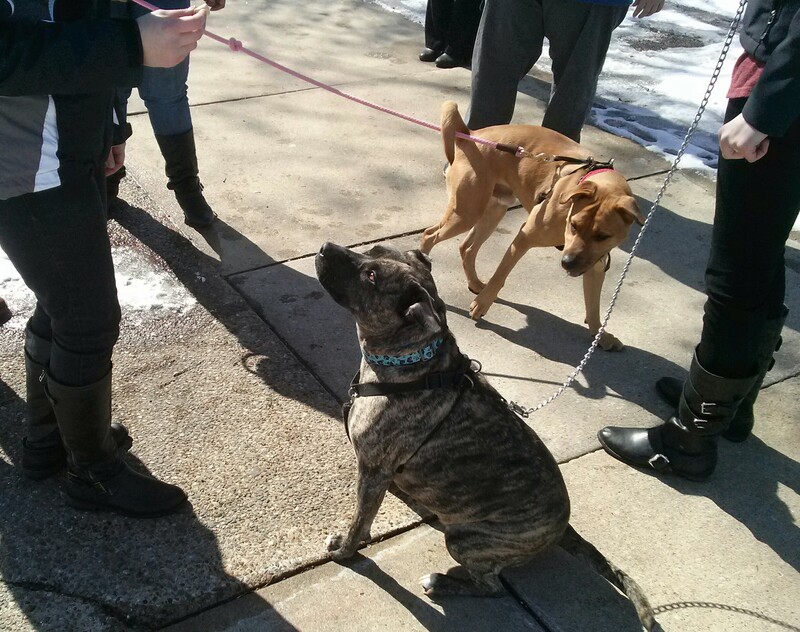 Community Outreach | This blog is affiliated with the Cedar Bend Humane Society in Waterloo, Iowa to share pet-friendly resources, adoption stories, and CBHS events. 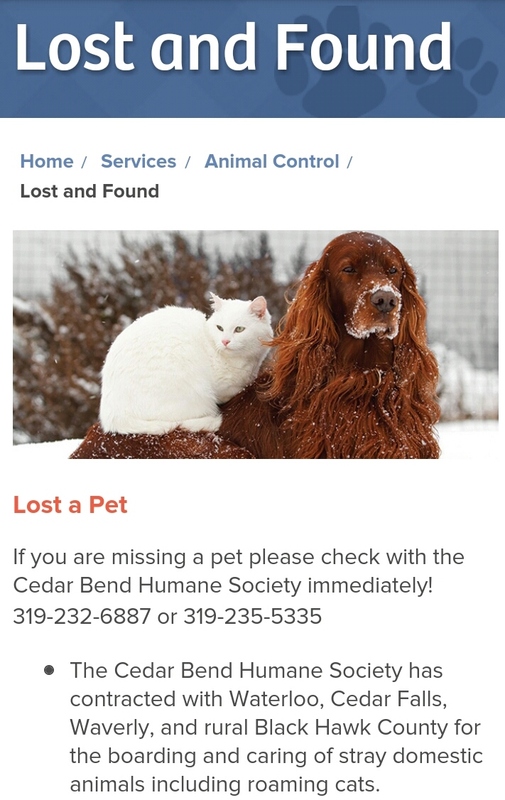 As a way to more efficiently handle lost and found pet reports, The Cedar Bend Humane Society has recently rolled out a new system for reporting, sharing, and viewing lost and found pets. 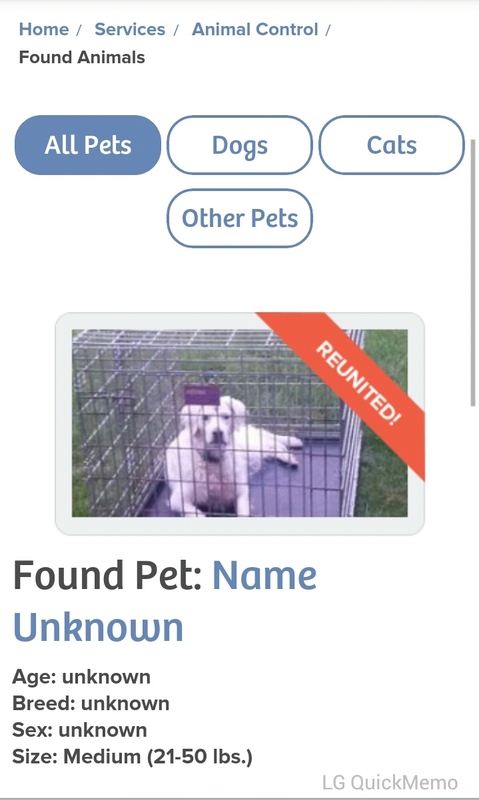 The Lost & Found page, which functions primarily as an online “bulletin board” can be found on our website, here, and includes two separate pages for pets reported lost by their owner, or found by someone in the community. If you have lost your pet, the first step is to call the animal control agency for your city or county. The Cedar Bend Humane Society includes the offices of the Black Hawk Animal Control, which responds to calls and aids in rescuing abandoned, sick or injured and stray animals from rural Black Hawk County. 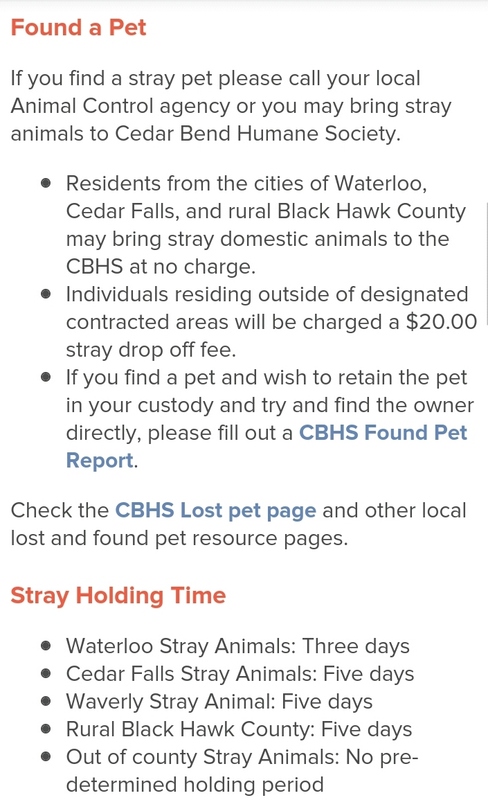 We have contracts with Waterloo, Cedar Falls, Waverly, and rural Black Hawk County for the boarding and caring of stray domestic animals including roaming cats. If you are missing your pet, we STRONGLY ADVISE you to first call The CBHS intake office at (319) 232-6887. We also invite you to visit our intake building to view our strays yourself, and redeem your pet if it is here. Also be sure to check our website to see if your pet has been reported as found. Our staff will post the report to our website, and send you a link of the post so that you can share via email, social media, or print a poster version. If you’ve FOUND a pet that appears to be lost, a Found Pet Report, found here, may be filled out and sent to CBHS in the same manner as Lost Pet reports. Lost and Found reports will remain on our website for 30 days, unless an extension is requested. 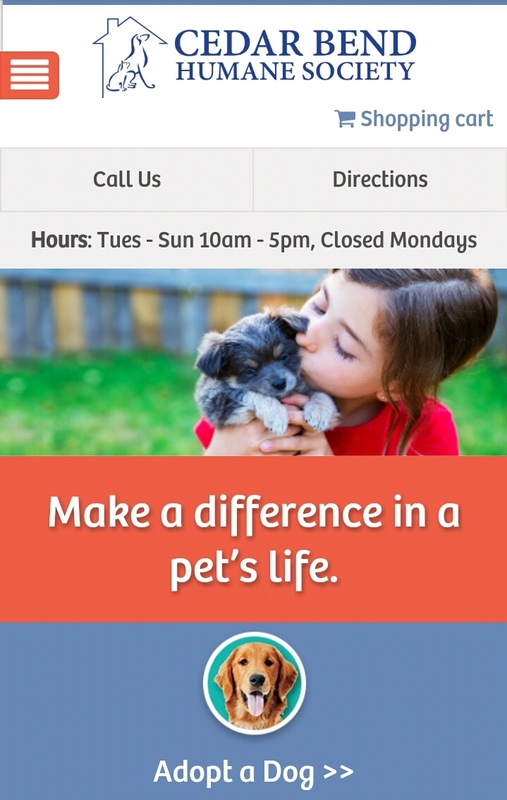 We ask that if the pet is returned to you, you notify is immediately so that we can remove the post from our website. *If you do not have easy access to a computer, you may call the intake office and a staff member will fill out the form with you over the phone. We still strongly recommend bringing in a photo of your pet to include with the report. 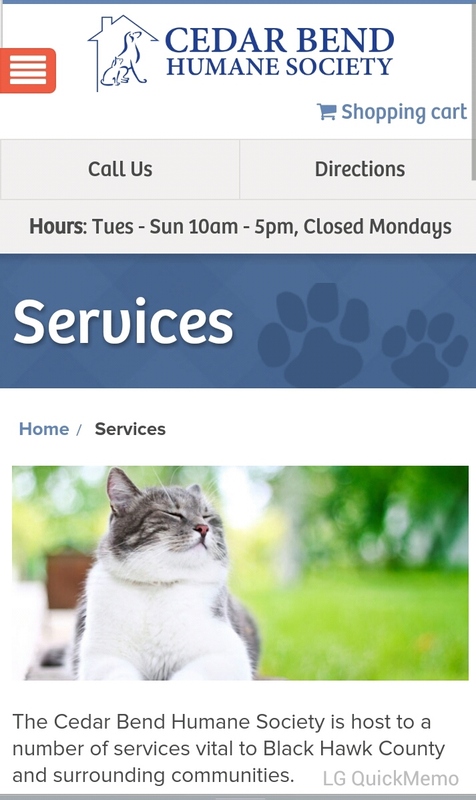 This page walks you through how to report your pet as lost. 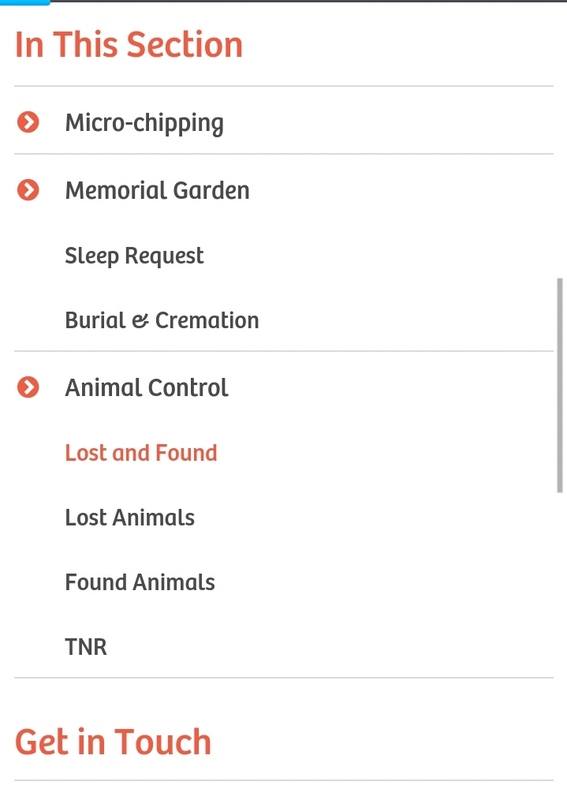 This page walks you through how to report an animal you have found. 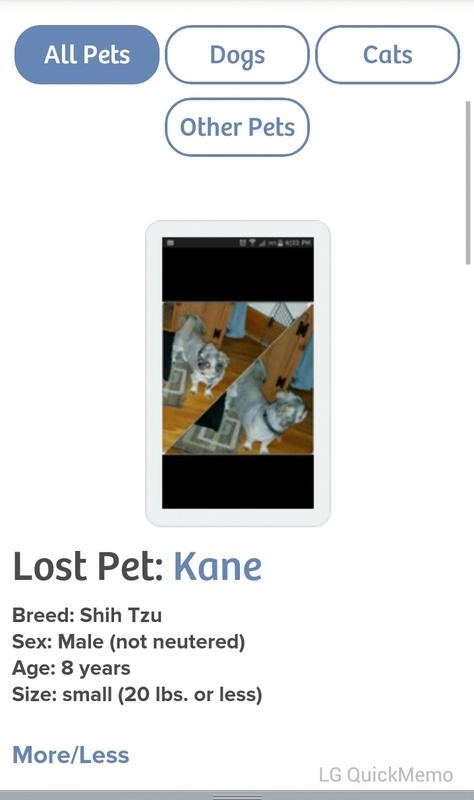 This is an example of a post found on the Lost Pet Bulletin Board. This is an example of a post found on the Found Pet Bulletin Board. 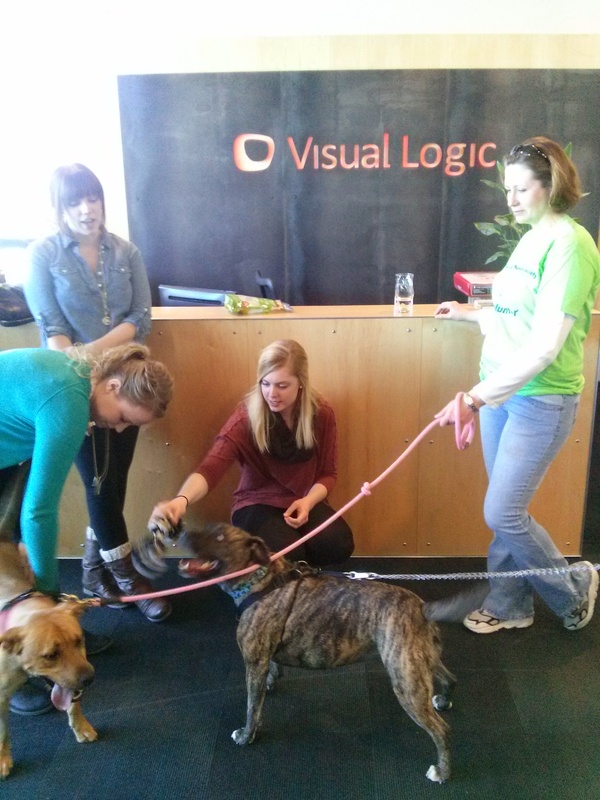 Visual Logic in downtown Waterloo invited us to bring some of our pets to their office. 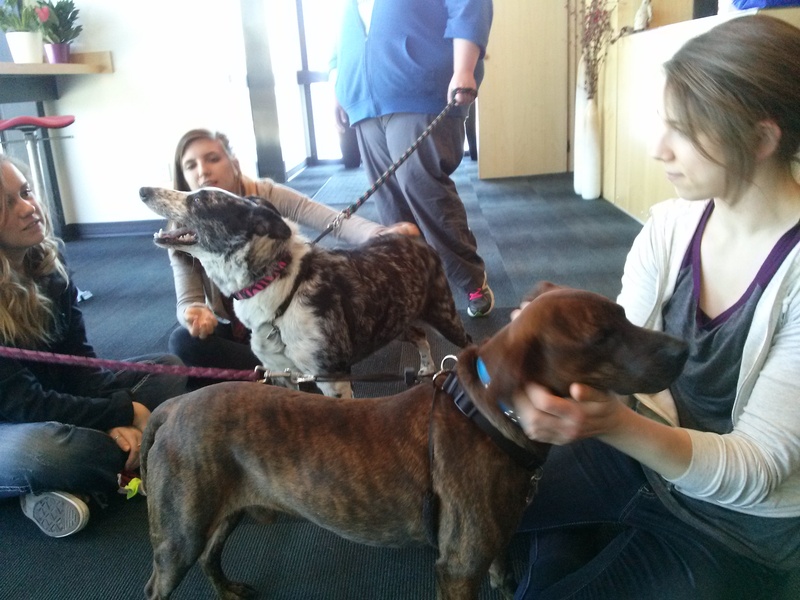 We took four dogs (Piper, Nacho, Pluto, & Reesie) to visit the employees at Visual Logic. 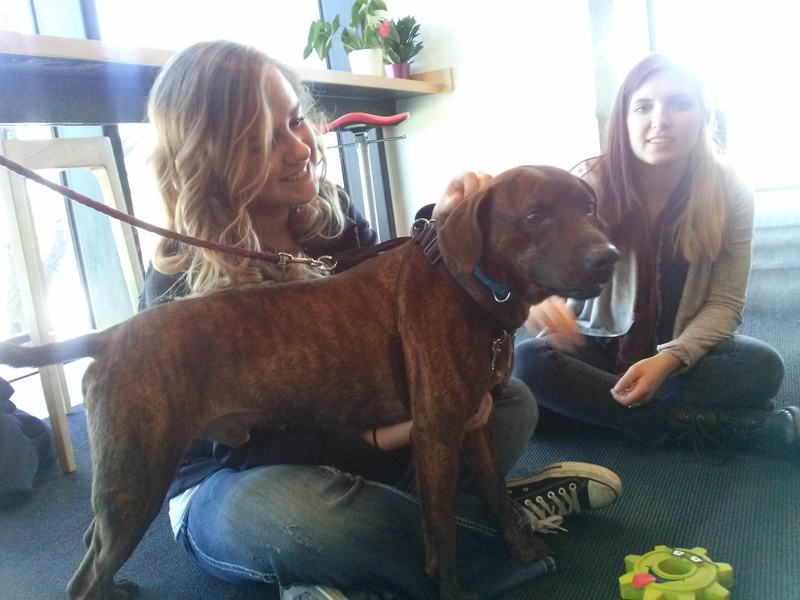 Our furry friends got lots of snuggles, treats, and affection from the employees. 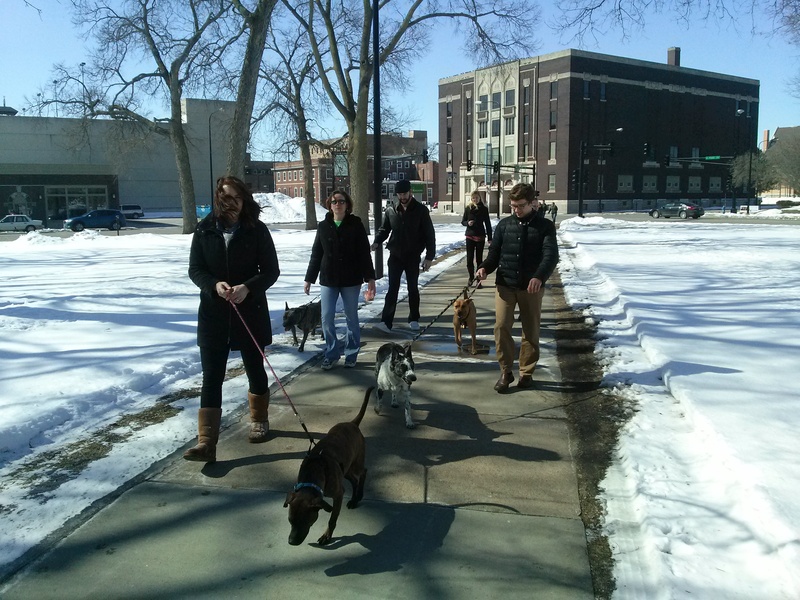 The dogs also got to enjoy some time romping around Lincoln Park in downtown Waterloo. Did you know spending time with animals on a regular basis reduces depression and anxiety levels? It also lowers blood pressure and cholesterol. Translation = Improved office morale and productivity! In addition, it’s great for us to get our pets out in the community and around new people. 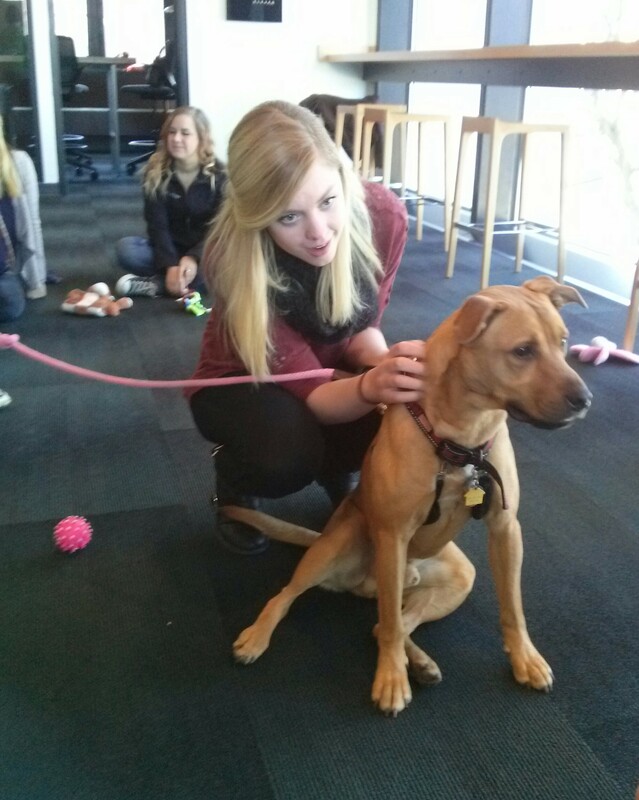 If you’re interested in having some Cedar Bend Humane Society pets visit your office, please call 319-232-6887. Our pets would love a chance to visit you at work. 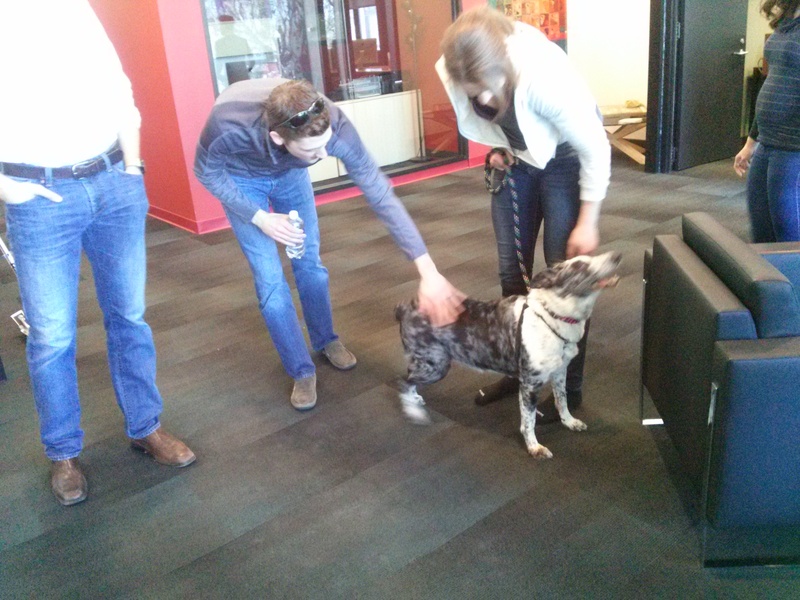 Thanks to Visual Logic for a great visit with our pets!